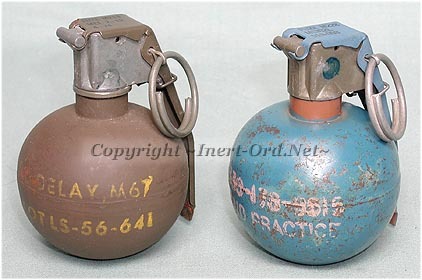 Developed about the same time as the M61 grenade, the M67 is smaller, easier to throw and of simplified manufacture. The body consists of two heavy sheet steel halves, welded together at the middle. The practice version, M69 is of similar construction but with no internal fragmentation matrix. It has a vent hole in the bottom to vent the practice charge. It is painted blue with a red tip on the end of the safety lever. Note the bottom of the M67 at left. 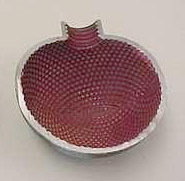 Just visible is some surface dimpling from the frag matrix which was stamped into the internal surface of the grenade body. Visible through the vent hole of the M69, you can see the remains of the detonator tube which contained the practice charge. There was no requirement for a hole plug as the M228 practice fuze is self contained. Here is a sectioned M67 grenade showing the internal construction. Fragmentation performance was not always consistent. 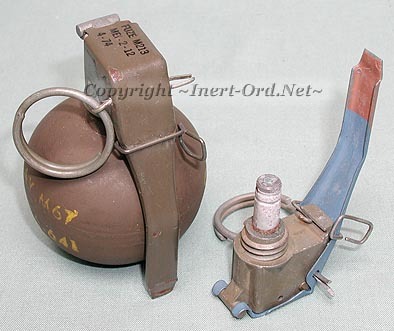 The sheet steel would sometimes just rupture without breaking up, which is a problem with many iron and steel body grenades, going back to the earliest grenade designs. 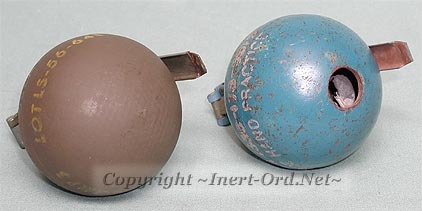 Modern fragmentation grenade bodies are more commonly made of plastics with either a separate frag coil inside or having an embedded matrix of small shot. The explosive easily pulverizes the body releasing the fragments. The M67 incorporates a secondary safety feature called the "Jungle Clip". It s a back-up safety device, used to clamp the lever to the grenade. Shown here is the second model. It is smaller and fits in a special recess cast in the fuze body. Unlike the first design, (see M61 grenade), this clip falls free of the grenade when unhooked. The grenade requires two separate arming actions; releasing the jungle clip and pulling the pin prior to throwing the grenade.